Is it possible a 13-year old could discern the different flavorings in Salumeria Rosi's charcuterie? Salumeria Rosi's window display shows the vast goodies inside. It would take more than one visit for your hungry 13-year-old to taste and discern different seasonings and textures in the range of classic Italian salumi at Cesare Caselli’s Salumeria Rosi but that would be a challenge. Take two friends so you can share. Move on to the escarole salad, Brussels sprouts or asparagus, the chef’s signature pontormo, soft scrambled egg salad with pork cheek. The lasagna portion is tiny – just a taste each for four. Our favorite pasta is the rigatoni amatriciana. Share a single sparerib or a special, perhaps meatballs on polenta. Two cheeses at the end. A seedling will open soon on Madison at 72nd Street but I suspect it will be fancier and more expensive. 283 Amsterdam Avenue between 74th and 75th Street. 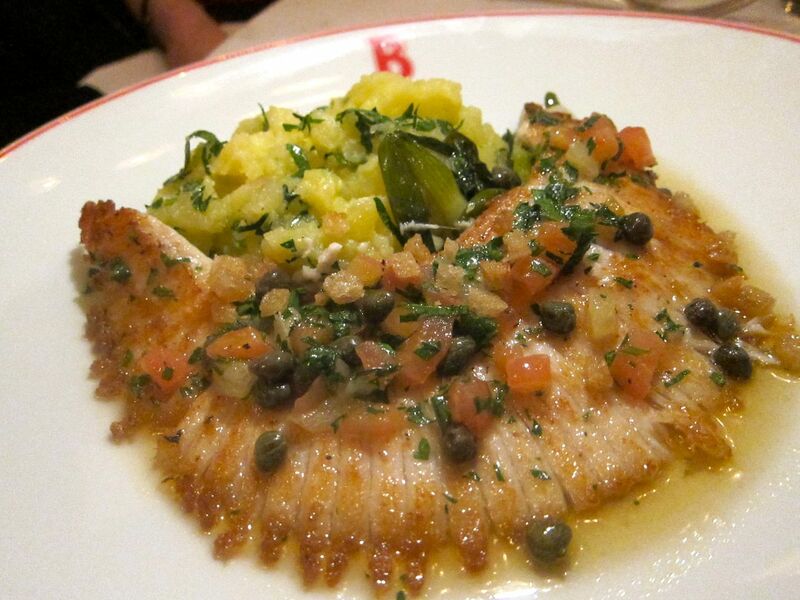 Skate from Benoit is a study in classics. Before you immerse him in molecular prestidigitation, I hope you’ve let your prodigy work out on the classics. I’d take him to lunch at Benoit or La Mangeoire for country and classic dishes or for charcuterie at Bar Boulud from French-trained veterans. Order the poached egg on frisée with lardoons, snails with crouton hats, classic skate in brown butter with lemony smashed potatoes from the new menu of Philippe Bertineau at Benoit. 60 West 55th Street between Fifth and Sixth Avenues. At Le Mangoire where Christian Delouvrier is now in charge, give the kid a lesson in how glorious foie gras can be, simply poached, silken and pink under a tiara of blond fat. You’ve missed the cassoulet season –but you might try the rabbit leg stewed in a ragout of white wine, tomato and terragon. 1008 Second Avenue between 53 and 54th Streets. The foie gras at La Mangeoire is topped with a spray of greenery. At Bar Boulud focus on the amazing varieties of terrines and pâtés. Daniel Boulud hired a chef from Paris’ most prestigious traiteur to teach his kitchen how. 1900 Broadway between 63rd and 64th Streets. Check out RedFarm (529 Hudson Street between Charles and Tenth Street) and Wong (7 Cornelia Street between West 4th Street and Bleecker Street) to see what creative genius and local products can do with Chinese and pan-Asian accents. Empellón Cocina (105 First Avenue between Sixth and Seventh Streets) is an evening with genius too. I would space out this immersion in sensual bliss lest the kid get hooked on eating too much. Photos of Salumeria Rosi may not be used without permission of Steven Richter. All rights reserved. Photos from La Mangeoire and Benoit may not be used without permission of Gael Greene. All rights reserved.